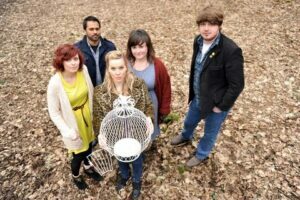 LTW premieres the Official debut video for ‘Tears (From My Heart)’ from Bolton-based indie folk group Second Hand Wings. Second Hand Wings Facebook page. It’s the joy of the unexpected that can deliver so much more than the hyped and over-anticipated. LTW finds how paths can cross in the unlikeliest places. It’s a late winter’s day in the Lake District. There’s a crystal-clear sky overhead, and you see the North laid out below you as your gods made it. Clarity, perfection and precision. The spirit soars, blue-cold air cuts the lungs. This is how it feels to be alive and vital. The day descends into a bar, swill-heads and piss-heads hold the floor. But there’s an open mic on a stand and a stool in the corner, so who knows what could happen. Yep, the obligatory guy doing his covers of a couple of Oasis numbers, he’ll be in. Tick. Here’s another few chancers too, struggling to capture the crowd. The couple at the table, who no longer have anything to say to each other, don’t raise an eye at the stumbling delivery. And you know you’re being taken back up onto the mountains, the spirit lifting again as a voice takes you there. This is rare. This is precious. This is a moment to be alive. And the silent couple, they become the norm. Bar room chatter is so wrong. The beer-boys fall silent as hearts are lost. This girl’s night-stealing delivery just has to be bookmarked for another day. And so it falls into place. That first song is out there, “we’ve recorded this on our debut album, Mountain City”. “We” is Second Hand Wings, and a new world opens. Heather Walkington-Peak is lead vocalist and co-writer of the Bolton-based five-piece. Mountain City, produced with Liverpool’s Scott Poley, was released in 2013 and the band is winning over audiences recently with their blend of indie folk. Here is the beauty of their creation. It is not of this time in the way that so many bearded hipster pseudos have tried to occupy a space that is not theirs to elbow into. There will be no elbowing Second Hand Wings offstage, they are very much of their own time. There is a lineage here with more than a tipping nod to Fleetwood Mac at the height of Stevie Nicks’ years. Where Heather Walkington-Peak’s voice engages most, it leads you through a darkness that layers complexity and emotion over precise melody and instrumentation. Backbeats run through the album which move this into a different space. Intricate patterns and laidback rhythms from drummer San Patel are given an added weight with Gabriella Guarino’s cello building depth and allowing Heather’s range to work right through. Poley’s production at times hints at some of his other work in Country, and the mix with Olly Neasham on lead guitar brings through a lightness of touch and delicious beauty echoing moods that change with every season. Whilst the sounds maybe of summer, it is sung with a winter’s heart. This is a band that won’t be afraid to test and challenge, whilst shunning gimmick. But it is in the writing of those lyrics that says Second Hand Wings are here to be heard. Thought and intelligence and humanity and honesty sear through. Inwardly digest and allow the music to move you as Heather and co-lyricist and vocalist Gabriella McBride intend. ‘Soldier’ is a standout song that deserves to be taken to the widest mainstream audience and put on repeat. After a decade of pop i-dulls-got-no-talent then this track reaffirms everything you’ve sought out. And along with ‘Gabriella’, ‘The Daughters’, ‘Chamonix’, as beautifully crafted and harmonized as you could hope to find, you know you are listening to something that many will be claiming as theirs one day soon. It really should be just a question of time. And with a stack of dates falling in place for upcoming events, then Second Hand Wings are to be seen and heard. It starts with headlining this Friday at Manchester’s Roadhouse and LTW will be there. The band has been working up new material and has introduced a handful of new songs to the set so take a look. Listen. Mountain City can be found on Spotify. The band can also be found on Facebook.